Kindhearted volunteer Marshall Scott answered the U.S. Marine Corps call to rescue me at the Charlotte, North Carolina, airport on Thanksgiving Day after I attended my son Luke Parker’s memorial service. Marshall took time away from his family Thanksgiving to make sure I made my connecting flight. Additionally he shared the legend of the Crucifix Fish. Jesus on the cross is outlined on the front of the sailcat’s skeleton, complete with the hilt of the sword that was plunged into Jesus’ side. The back of the skeleton displays the Roman shield. When you shake the cross, you can hear the dice being tossed for the Lord’s clothing. When I got back to Scotland, my research disclosed that gaftopsail catfish witness God’s love in life, too. For example: Jesus died on the cross and went down for hell for three days to take the keys of death and hell away from satan and secure eternal life for us. The sailcat lives on the soft bottom of the ocean – but unlike other catfish – it doesn’t feed there. Just as Jesus loves and accepts everyone of every color, every country, every social status in life, the sailcat feeds up and down through the entire water column. Male gaftopsail catfish brood their young in their mouths until they hatch. During this entire period of up to 65 days, males do not eat. What a great parallel of Jesus’ nature; His willingness to sacrifice even His life that we might be born again and grow into His image. Jesus never leaves us nor forsakes us when we are weak. Sailcats are saltwater catfish. As Christians, we are instructed to be salt in the world. We should walk in love, but also in truth. Our truth – salt – has great healing power. Crucifix Fish skeletons are popular for jewelry, but rare. 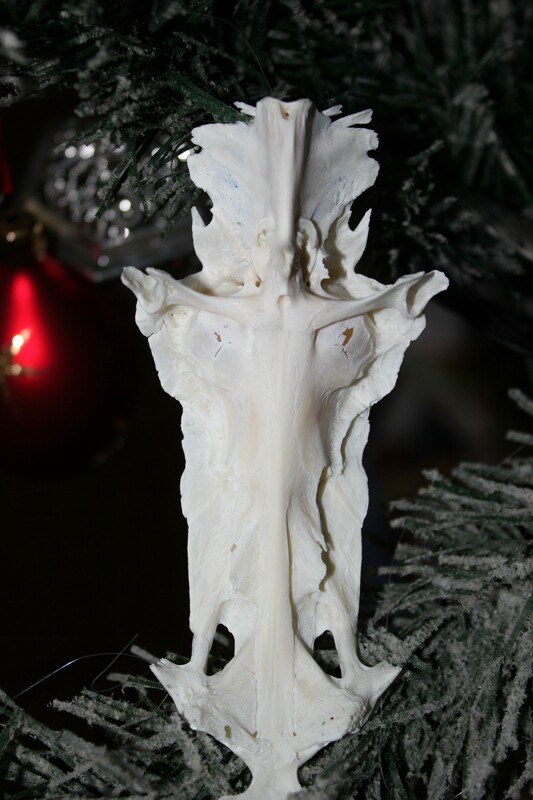 Imagine my delight when I received a Christmas present from the Scott family, a box containing a Crucifix Fish! It will be freely shared here, going so much further than just our house. What a great New Year it would be if we all took lessons from Crucifix Fish: witness Jesus openly both in this life and in the memories left behind when graduating to heaven. Love and accept others, no matter how different. Get out of the comfort zone and dare to be salty! Put others first. For 2014, I want to live like a Crucifix Fish. Texas Eugenia Thornhill, in my new Christian mystery-romance-suspense “Fear of Shadows,” reminds me of the lessons of the Crucifix Fish. She is too self-reliant and self-sufficient to need God until she solves the mystery of her fear of shadows. The truth almost destroys her. There is power in the Cross of Jesus, but to tap into it – Texas would need to get out of her comfort zone and get salty. Can the proud, independent Texan who embraces one rebellion after another do that?